Originally signed by Twins as a non-drafted free agent on 9/8/11...Signed by Twins scout Jose Leon...Married, wife's name is Jennifer Andreina Sánchez Lugo...The couple has a daughter, Alessa Josefina Vielma Sánchez. Entered 2017 rated as the 25th-best prospect, Best Defensive Infielder, and possessing the Best Infield Arm in Minnesota's minor league system by Baseball America...Hit a combined .229 (95-for-415) with 17 doubles, two triples, 35 RBI, and 43 runs scored in 121 games between Double-A Chattanooga and Triple-A Rochester...Began season with Chattanooga...Recorded multi-hit games four times over a five-game stretch from 4/10-15...Ended the month of April hitting .320 (24-for-75) in 21 games...Was promoted to Rochester on 5/15...Hit safely in 12 of 14 games between 8/13-29...Made a total of 103 appearances at shortstop and 16 at second base between Chattanooga and Rochester...Played for the Tigres de Aragua of the Venezuelan Winter League, appearing in 34 games and hitting .240 (23-for-96). Was an invite to Twins spring training for first time in career; reassigned to minor league camp March 14 and began season with Double-A Chattanooga. Placed on 7-day disabled list April 13 with a right hamstring strain; reinstated April 21. Played in eight games for the Lookouts before being placed back on disabled list May 2 with left oblique strain; reinstated May 28 and reported to Single-A Ft. Myers, where he played eight games. Promoted back to Chattanooga June 7. Hit .338 (26-for-77) as right-handed batter for the Lookouts and .249 (59-for-237) as left-handed batter. Combined to hit .265 (90-for-339) with seven doubles, four triples, 52 runs scored and 12 stolen bases in 98 games between Ft. Myers and Chattanooga...played 61 games (all starts) at shortstop, 22 games (all starts) at third base and 14 games (all starts) at second base. Added to Twins 40-man roster November 18. Named 25th best prospect, best defensive infielder and possessing best infield arm in Twins system by Baseball America entering 2017. Spent entire season with Ft. Myers...Entered campaign ranked by Baseball America as Minnesota's 22 nd -best prospect, possessing the "Best Infield Arm," and Minnesota's "Best Defensive Infielder"...Ranked sixth in the Florida State League in stolen bases and tied for seventh among all High-A players...Led the Miracle in hits (119), at-bats (441), and stolen bases (35) while ranking second in games (120), runs (49), and total bases (135)...Was named the Twins' minor league Player of the Week for 8/8-14 after hitting .467 (7-for-15) with one double, two RBI, two runs scored, and a .529 on-base percentage in four games for the Miracle...Made all 120 of his defensive appearances (118 starts) at shortstop. Spent entire season with Class-A Cedar Rapids...was named the Twins minor league Player of the Week after batting .423 (11-for-26) with two doubles, one triple, eight runs scored, and three RBI in seven games between 5/12-18. Hit a combined .234 (36-for-154) with three doubles and 12 RBI in 48 games between the GCL Twins and Rookie-level Elizabethton...Began the year in the Gulf Coast League before being promoted to Elizabethton on 8/24. Spent first professional season with the Dominican Summer League Twins...Ranked second on the team in runs and stolen bases and was third in hits and total bases (52). March 31, 2019 SS Engelb Vielma assigned to Aberdeen IronBirds from Norfolk Tides. December 18, 2018 Aguilas del Zulia traded OF Jose Tabata to Tigres de Aragua for SS Engelb Vielma. December 10, 2018 SS Engelb Vielma assigned to Tigres de Aragua. November 27, 2018 Baltimore Orioles sent SS Engelb Vielma outright to Norfolk Tides. 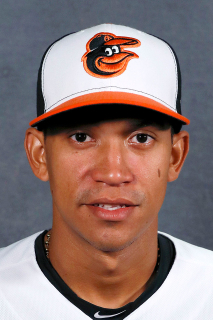 November 20, 2018 Baltimore Orioles designated SS Engelb Vielma for assignment. October 2, 2018 Baltimore Orioles recalled SS Engelb Vielma from Norfolk Tides. May 10, 2018 Norfolk Tides placed SS Engelb Vielma on the 7-day disabled list. Right knee injury. May 8, 2018 Baltimore Orioles optioned 2B Engelb Vielma to Norfolk Tides. May 1, 2018 Baltimore Orioles recalled Engelb Vielma from Norfolk Tides. April 20, 2018 Baltimore Orioles optioned SS Engelb Vielma to Norfolk Tides. April 11, 2018 Baltimore Orioles recalled Engelb Vielma from Norfolk Tides. March 23, 2018 Baltimore Orioles optioned SS Engelb Vielma to Norfolk Tides. January 26, 2018 San Francisco Giants traded SS Engelb Vielma to Baltimore Orioles. January 23, 2018 San Francisco Giants designated SS Engelb Vielma for assignment. January 18, 2018 San Francisco Giants claimed SS Engelb Vielma off waivers from Pittsburgh Pirates. January 14, 2018 Pittsburgh Pirates designated SS Engelb Vielma for assignment. December 11, 2017 Pittsburgh Pirates claimed SS Engelb Vielma off waivers from Philadelphia Phillies. November 20, 2017 Philadelphia Phillies claimed SS Engelb Vielma off waivers from San Francisco Giants. November 6, 2017 SS Engelb Vielma assigned to Tigres de Aragua. September 14, 2017 San Francisco Giants claimed SS Engelb Vielma off waivers from Minnesota Twins. September 14, 2017 SS Engelb Vielma assigned to Sacramento River Cats. September 12, 2017 Minnesota Twins designated SS Engelb Vielma for assignment. June 2, 2017 Rochester Red Wings activated SS Engelb Vielma from the temporarily inactive list. May 30, 2017 Rochester Red Wings placed SS Engelb Vielma on the temporarily inactive list. May 15, 2017 SS Engelb Vielma assigned to Rochester Red Wings from Chattanooga Lookouts. March 29, 2017 SS Engelb Vielma assigned to Chattanooga Lookouts from Rochester Red Wings. March 18, 2017 Minnesota Twins optioned SS Engelb Vielma to Rochester Red Wings. November 18, 2016 Minnesota Twins selected the contract of Engelb Vielma from Chattanooga Lookouts. June 7, 2016 SS Engelb Vielma assigned to Chattanooga Lookouts from Fort Myers Miracle. May 28, 2016 SS Engelb Vielma assigned to Fort Myers Miracle from Chattanooga Lookouts. April 21, 2016 Chattanooga Lookouts activated SS Engelb Vielma from the 7-day disabled list. April 6, 2016 SS Engelb Vielma assigned to Chattanooga Lookouts from Fort Myers Miracle. December 17, 2015 Minnesota Twins invited non-roster SS Engelb Vielma to spring training. September 20, 2015 SS Engelb Vielma assigned to Tigres de Aragua. July 18, 2015 Fort Myers Miracle activated SS Engelb Vielma from the 7-day disabled list. July 10, 2015 Fort Myers Miracle placed SS Engelb Vielma on the 7-day disabled list retroactive to July 9, 2015. April 7, 2015 SS Engelb Vielma assigned to Fort Myers Miracle from Cedar Rapids Kernels. March 29, 2015 SS Engelb Vielma assigned to Minnesota Twins. July 16, 2014 Cedar Rapids Kernels activated SS Engelb Vielma from the 7-day disabled list. July 7, 2014 Cedar Rapids Kernels placed SS Engelb Vielma on the 7-day disabled list. May 21, 2014 Cedar Rapids Kernels activated SS Engelb Vielma from the 7-day disabled list. May 14, 2014 Cedar Rapids Kernels placed SS Engelb Vielma on the 7-day disabled list. Strained right hamstring. March 29, 2014 SS Engelb Vielma assigned to Cedar Rapids Kernels from Elizabethton Twins. August 24, 2013 SS Engelb Vielma assigned to Elizabethton Twins from GCL Twins. May 31, 2013 Engelb Vielma assigned to GCL Twins from DSL Twins. June 1, 2012 Engelb Vielma assigned to DSL Twins. September 8, 2011 Minnesota Twins signed free agent SS Engelb Vielma to a minor league contract.